Horrors! You ate them like snacks! So brave HB la you. I have seen all these snacks at village fairs when I was a kid living growing up in the South. 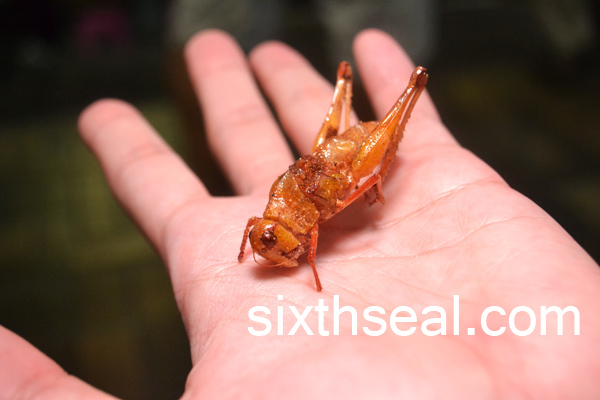 My mum used to eat those huge grasshoppers/locust wth sambal belacan which were about 4-6 inches long! Nothing could make me open my mouth to eat them. Ha ha! I think you felt unwell due to the worms! Hope their eggs didn’t hatch inside you!! Scary la my mouths! I always say I’m only afraid of spiders, but I honestly don’t like beetles too, especially if they’re that big and fly at me. I don’t mind eating them though, they tasted surprisingly good! You should check it out if you’re in Bangkok! The grasshoppers we got were about 4-5 inches long, didn’t see any 6 inch long monsters. I imagine – think of how painful a bite is and then think of eating a few of those ants all at once. Just pluck off the head and pop them in your mouth. Haha! She doesn’t like worms either, while I’m afraid of spiders (and also beetles as I found out) but I’ll eat them just for the experience. It’s quite tasty, except for the wings that sticks to the top of your mouth. So does your girlfriend let you kiss her after this? LOL! She had the frogs and grasshoppers. 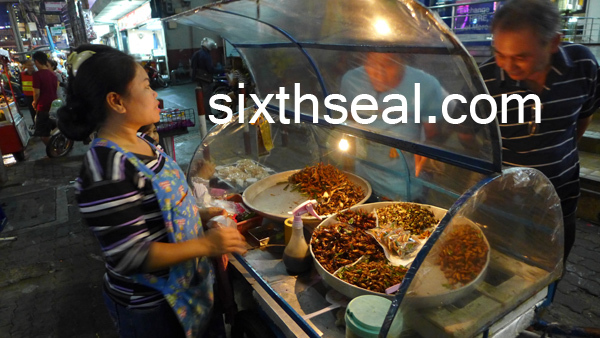 I particularly liked the grasshoppers, red ants are the least favorite. I think they’re borderline poisonous coz I felt sick after eating them. …or maybe you just aren’t supposed to eat that much. *raise eyebrows*…. I salute you for trying all of them! It’s tasty and it’s an insect buffet! I was glad to have the opportunity to try all of them. I particularly liked the grasshoppers but I didn’t know I had to pull off the legs before I ate them – the spines kept cutting my tongue! Gotta try new things, especially on the local food side of things. I quite liked the grasshoppers and beetles. i rmb eating these when i was a kid on holiday in thailand. when they fry them with soy sauce, thats all yall taste. I think prolly the ants made ya sick, also might be the beetles cos ya suppose to peel off the legs, wings, head and just eat the belly. Thanks for sharing that mate! I didn’t know you have to peel off the legs and wings and head. I’ll have liked the beetles better if the wings didn’t stick to the top of my mouth and the grasshoppers if the spines on the legs didn’t cut my tongue. :D Thanks for the review, now i know what to expect. can’t wait to try them. It’s good stuff – I recommend trying all of them but take it easy on the red ants. I still think they’re quite poisonous in large quantities – good to try but not too much. I don’t know, I just felt sick after that. LOL HB, you really will try *anything* once!! Enjoyed reading this post, as I do with all your exotic food/experiences post. 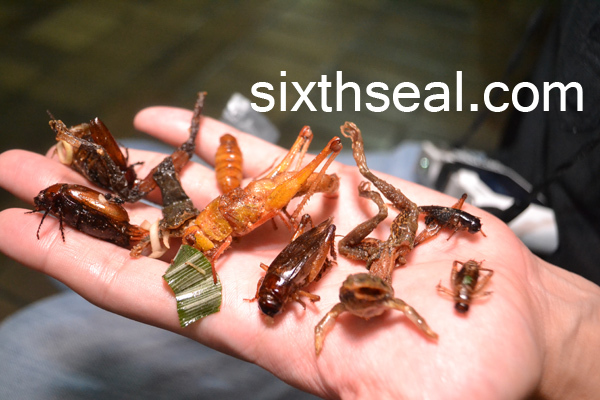 I’m heading to Bangkok/Vietnam/Cambodia/Laos/Philippines for a SE-Asia flavoured trip on my next trip home (mid July) but I don’t think I will venture into the world of friend bugs or duck fetuses! Thanks for the kind comments Jyannis! I hope that you enjoy your trip during winter break (unless you’re in the Northern Hemisphere – always thought you’re down under). Do give us a buzz if you happen to drop by Malaysia! Bangkok has changed over the years though, it has become more like KL nowadays. A lot of people only tried the grasshoppers but I thought having the entire insect buffet would be much more appropriate. The are stranger ones in China! How was the red ants cooked? They have even more unusual ones in China though. 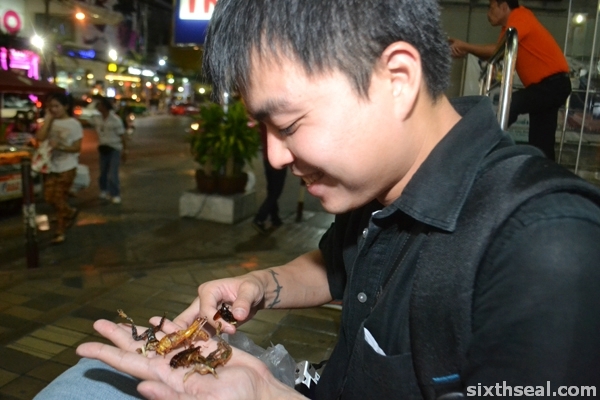 I thought the fried grasshoppers were tasty! HB, I thought in Australia certain tribes eat grub worm and they said it taste like potato when cooked. In Asia certain insects use in medical so must be good. I had it in Mukah, a few hours from my hometown. Just pluck off the head and eat it! I thought it was creamy and delicious! 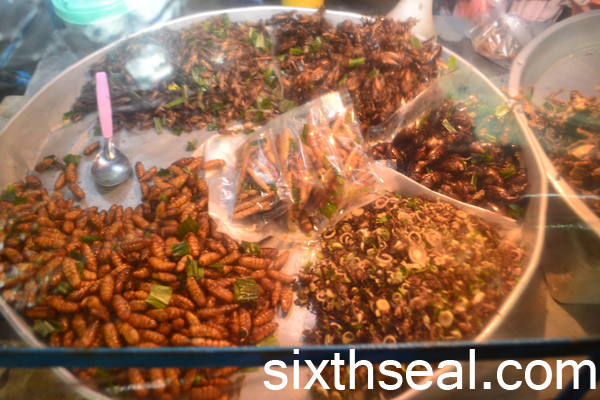 I think I will all those fried insects food….don’t think I can open up my mouth and swallow them. I’m actually a bit apprehensive of grasshoppers and beetles (don’t like things that fly or hop at me at high speeds). I also saw a swarm of huge horned beetles while in Kanowit (small town in Sarawak where my dad was working when I was 13 or so) and that really scared me. 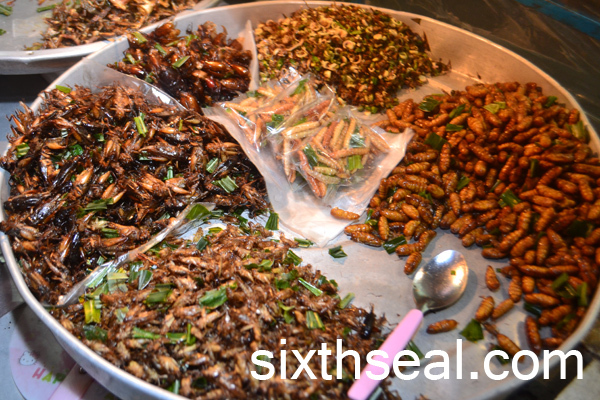 The fried insects are pretty good though…except for the red ants. I felt sick after eating them. HB, They certainly taste good with salt, sugar or MSG, basil or other herbs. For some hardcrusted insects you’ve to remove the thorny legs and wings first. 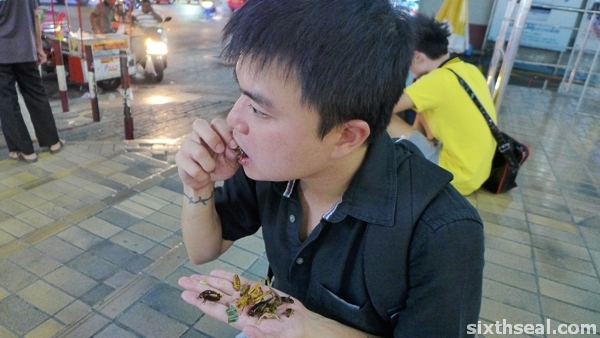 Anyway, congratulations that you beat the UN’s announcement to eat more insects! I didn’t know that! I would have enjoyed the grasshoppers and beetles a lot better had I known I had to remove the legs and wings first so it didn’t cut my tongue or stick to my mouth. I agree, it tastes good from the salt and soy sauce. i did exactly the same thing when I went to bangkok for the first time. It’s like a must try and I must say that it’s not really scary as they are all so crispy. I felt a bit apprehensive arranging them on my hand to be honest. Haha! They all taste good though, except for the red ants, which I think was the culprit in making me sick.